Microsoft was co-founded 40+ years ago in 1975 by Bill Gates. The tech giant is headquartered in the US state New Mexico. It’s best known for products including Windows operating systems (OS), Microsoft Office suite, and Edge and Internet Explorer web browsers. In 2018 Microsoft earned over $110 million in revenue. Microsoft originally released Office 365 for business in 2011. The subscription service offers access to Microsoft applications, online productivity, and business services like hosted email, web conference, and online storage. You might be wondering: What is Office 365 for business? 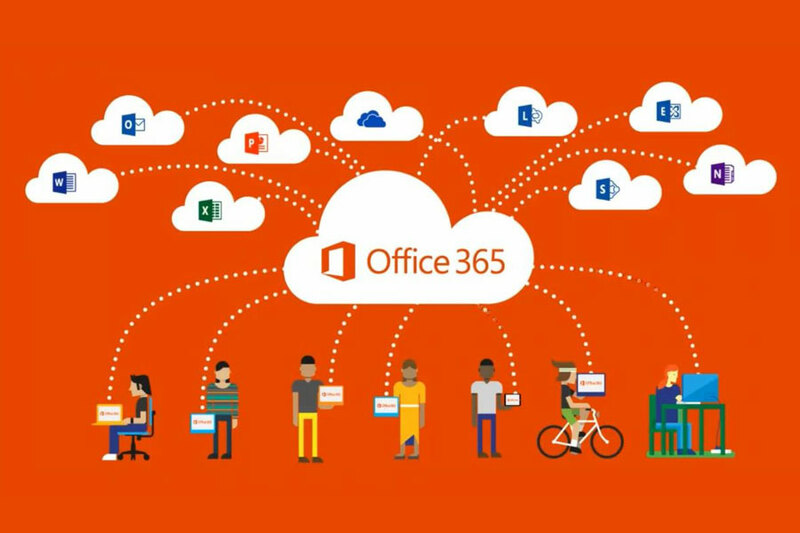 A business subscription to Microsoft Office 365 you can run your company via the cloud and allow Microsoft to handle the Information Technology (IT) side of things for you. What does this mean for your business? You won’t have to deal with tasks like setting up things like databases, file shares, on-site software, or servers. This frees up more time to take care of business. You can also use Office 365 for businesses of all sizes. You can use Office 365 for one-person businesses or add employees if you have them. This allows you to interact seamlessly with customers. Each user can install these apps on a maximum 5 PCs/Macs, 5 smartphones, and 5 tablets. Each user gets 1TB of OneDrive for Business cloud storage. You can access it anywhere and sync with Pc/Mac for offline access. You can use Offline Online to access online versions of Word, Excel, PowerPoint, and OneNote. You can use the presentation software Sway to create/share interactive presentations, reports, and personal stories. You get 1TB of OneDrive storage and sync clients for each desktop platform. Data is kept in a separate location from Windows 10 clients. One of the features lets user view/manage cloud-based storage via File Explorer Administrators. You can upgrade to unlimited storage if 1TB isn’t enough for your company. These collaborative platforms include features like HD video conference, unified communications, and instant messaging. Microsoft Teams provides more an upgraded feature set, so it’s a good option for companies look like Slack-like apps. This email offering gives each Office 365 subscriber a 50GB mailbox that can access email via web browser or with Outlook app on PC/Mac/mobile. Features include malware/spam filtering, shared mailboxes, and eDiscovery (some subscriptions). This interface lets teams share files and sync info in File Explorer via OneDrive’s desktop client. Exchange Online and SharePoint have administrative controls so users can’t share classified info outside a company. Plans like 365 Business Premium include various services for small/medium-size businesses like customer relationship management (CRM) tools and invoicing. In addition, Enterprise plans include Power BI Pro and Yammer. Office 365 Business gives you the ability to use familiar tools like Microsoft Word, Excel, Outlook, and PowerPoint wherever you are and when you need to access them. This is a valuable tool in today’s on-the-go world in which the Internet, cloud, and social media have made businesses significantly more mobile. Office 365 Business makes collaboration significantly easier. Since files are stored via the web, you can co-author and share files in real time. You can also use this feature regardless of where you are in the world as long as you have web connectivity. Your files are stored online via Online, so they’re always updated and in sync. You’ll also get the newest versions of Office applications so you won’t have to worry about technical problems due to old versions of software. You’ll get regular updates that are rolled out automatically. EASY ADMINISTRATION – You don’t need any IT know-how or experience to deploy/manage Office 365 over a business/organization. RELIABLITY/SECURITY /PRIVACY – Offerings like Office 365 Business UK include guaranteed 99.9% uptime, 5 layers of security/proactive data monitoring, and privacy protection. DIRECTORY INTEGRATION – Office 365 lets you manage user credentials/permissions via Active Directory’s single sign-on/synchronization. CUSTOMER SUPPORT – Microsoft’s customer support includes how-to resources, phone/online support, and community forums. It’s important to review factors like the specific apps/services offered with each plan. A plan with lots of bells & whistles might not be what your company needs. Then there’s the cost of the monthly subscription service for different Office 365 plans. It’s important to consider your company’s monthly budget since some plans might be too pricey especially since they’re charged monthly. That said, Office 365 is an investment in your company so in some ways the benefits your company can get in terms of productivity/efficiency are priceless. These are good versions of the full Office apps although they include some small feature limitations. Take note if your device’s screen is bigger than 10.1 inches like 12.9-in. iPad Pro you’ll have to buy the pay version of Office 365. You probably shouldn’t buy a PC just to get Office 365 free. However, many PCs are bundled with one full year of Office 365 with a value of about $100. If you want to just use Word, Excel, or PowerPoint for a month, then you should consider a trial version. You’ll have to provide Microsoft with your credit card number and it’s important to cancel the trial prior to the month is over. Otherwise, you’ll end up paying for the Office 365 Home edition for one full year. These are feature-limited versions of the Office applications. These offerings are a response to free Google Docs products and actually include more complete versions vs. the search giant. Just make sure the free Office Apps work with your web browsers. This is another 30-day trial for possible Enterprise customers. If you get the evaluation download, you can share it with a maximum of 25 people. If you’re a student or teacher with the “right .edu email address, you might get the full version of Office 365 for free. The caveat is your school must buy an educational license for Office. There are reports you can get another free trial with a different email address/credit card. It’s a lot of work to get a free month of Office 365 but might be worthwhile if you want to save some money. Can I buy Office 365 using a credit card? Yes, you can use any major credit card. The subscription amount shows up on your monthly credit card statement. Why should I consider Office 365 plans with PC/Mac versions of Office? These plans include 365 Business, Business Premium, and Enterprise E3. One key benefit of having a PC/Mac version of Office applications is your business can work offline then the work will sync automatically the next time you connect to the web. So you won’t have to worry about documents being updated. A desktop version of Office is also updated/upgraded automatically when you connect to the net. This helps to make sure you have the latest and greatest tools to do your company’s work. How can I get help setting up my Office 365 plan? You can find Microsoft experts since they’re trained IT/development companies that can help your business transition to Office 365. They also create customized solutions for your company. Microsoft Pinpoint includes a listing of all Microsoft experts. Office 365 for Business supports up to 300 users. If you have over 300 users now or might in the near future, then you should consider Microsoft’s other plan options. Is web connectivity required to use Office 365? You’ll need Internet access in order to install/active and every Office 365 plan. You’ll also need the web to manage your company’s subscription account. Furthermore, you’ll need web connectivity to access various Office 365 cloud productivity services. That includes services like email, IT management, and conferencing. This customer success service is available for Office 365. It helps your company smoothly transition to Office 365 and provides faster business value. Microsoft FastTrack is made up of hundreds of partners and IT professionals with a positive experience using Office 365. Microsoft’s FastTrack engineers provide personalized/remote assistance so companies can have an effective technical environment through a smooth experience via on boarding/migration. Mycroft’s FastTrack Centre contacts qualified customers within 30 days after they purchase Office 365. The company’s FastTrack resources/services are bundled in Office 365 customers who have Office 365Business & Enterprise plans with 150+ seats, It’s also included with paid Government, Non-profit, and Kiosk plans. You can do that at any time after signing up for 365 Office Business. You can secure the monthly or annual commitment payment. Is it possible to switch to different Office 365 plans? Yes, you can do that. If you wish to upgrade, you can transition your current 365 Office plan to another plan. For instance, you could upgrade to an Office 365 Enterprise plan from an Office 365 Business plan. In the case you have a monthly commitment subscription Microsoft won’t charge any penalty if you cancel your contract. Meanwhile, you might incur penalties if you cancel your annual commitment subscription that’s paid monthly. If you paid for your yearly commitment subscription up-front, you won’t receive a refund if you cancel before the full contract period. Make sure to read the full Microsoft Online Subscription Agreement (https://products.office.com/en-gb/business/office-365-business) for more details about cancelling Office 365 subscriptions. Is it possible to mix & match Office 365 plans? Yes, you can do that. Take note that at the plan level some license limitations exist. For example, there’s a 300-user limit for 365 Business, Office 365 Business Premium, and Business Essentials, Meanwhile, Enterprise plans support unlimited number of users. If you want to mix & match Office 365 plans, you have several options. For example, your business could buy 300 Business Essentials seats, 300 Business Premium seats, and 500 Enterprise E3 seats. How does an Office 365 subscription affect my domain name? You can add your company’s domain name to Office 365 Business to make domain-based email addresses. First, find your DNS hosting provider or domain registrar. Then compare various domain management offered through Office 365 subscriptions. If I cancel my subscription what happens to my data? You keep it. You can download the data like email/documents on your company’s team sites then save it at another location. Make sure to save your data prior to canceling your subscription. If you cancel your subscription, all data related to the Office 365 account is available to the administrator for 90 days. Keep in mind the data is only available for limited function. If you have any questions about Microsoft Office 365, please visit our site www.anikatechsupport.com Our friendly and knowledgeable support team is trained to deal with any Microsoft-related questions or problems your business has.